During his distinguished career, Martin Garbus has established himself as a well-known trial lawyer representing the likes of Daniel Ellsberg and Leonard Peltier. 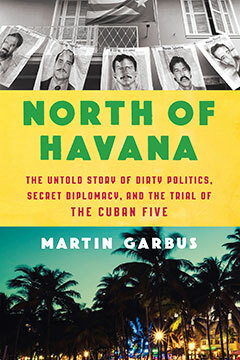 But there is no story Garbus wants to tell more than that of his most challenging case: representing five Cuban spies marooned in the U.S. prison system and his efforts to get them out. North of Havana tells the story of a spy ring sent by Cuba in the early 1990s to infiltrate anti-Communist extremists in Miami. Erroneously charged by the U.S. government in connection with the 1996 shootdown of two planes circulating anti-Castro leaflets over Havana, the spies—in the absence of evidence—were convicted in 2000 of conspiracy to commit espionage and murder. Caught up in the sweep of history, the Cuban Five, as they became known, played a central role over the next decade in the recent thaw in Cuban-American relations. Set in Miami and Havana, North of Havana is a mesmerizing tale of international intrigue, espionage, and political gamesmanship that continues to play a shaping role in American foreign policy and presidential elections. In the process, the books shows how the justice system can be, and is, subverted for political purposes and gives readers insight into one of the most fascinating legal cases of our times.